Business phone service from e-vergent is a smart option if you are looking for great phone service for your business. We offer premier Voice over Internet Protocol (VoIP) phone systems that are rapidly taking over legacy phone lines. Analog phone lines and outdated digital PBX systems are costly to maintain and require trained technicians to program, which is pricey and time-consuming. A VoIP phone system from e-vergent can give your business greater features, combine your bills, and save your company money. 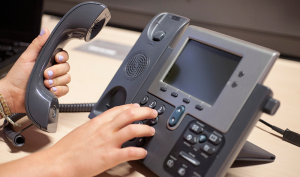 With an e-vergent VoIP phone system, phone calls are sent over your internet connection, which provides more cost-effective local and long distance calling and conference bridging. Billing is a snap when you combine e-vergent phone service with your existing e-vergent internet service plan. If you’re moving buildings or expanding, it’s far easier to coordinate with only e-vergent than trying to coordinate with multiple companies. Plus, e-vergent business phone systems provide great features like voicemail to email and powerful forwarding rules. Our most popular business phone service plan is called PBX in the Cloud. This plan provides the stability and versatility of a PBX system with its framework in the cloud. This is our most powerful phone plan for businesses. It’s perfect for companies who require a high-performing phone system that is also cost-effective. Interested in VoIP phone service for home? Click here to learn about our Residential Phone Service. Dedicated fax lines are also available with the e-vergent phone systems. Each line is $199 for installation and $34.95 per month.